The Public Company Accounting Oversight Board’s two-day Standing Advisory Group Meeting took place in Washington, DC on June 5-6. Topics included data and technology, cybersecurity, current and emerging audit issues, corporate culture and its implications for the audit, as well as the new auditor’s report. 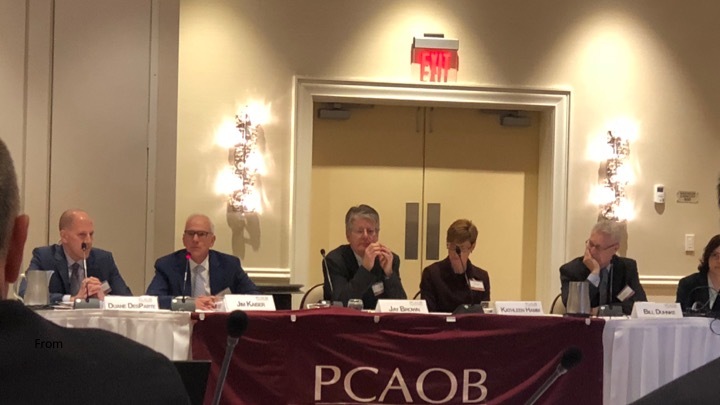 The Standard Advisory Group (SAG) advises the PCAOB on the development of auditing and related professional practice standards. The SAG includes investors, auditors, audit committee members, public company executives, and others. This was the first meeting of new PCAOB Board members, ushering in a new era of the PCAOB. *John Bendl, Chief Accounting Officer, Treasurer, and Controller, The Vanguard Group, Inc. The MACPA’s Executive Director/CEO, Tom Hood, and Rebekah Brown, Director of Development, conducted the presentation “Data and Technology Trends in the Profession.” In this period of exponential change, technological and otherwise, there are several significant challenges hovering around public accounting firms. These challenges and opportunities were presented and discussed during the MACPA session, hitting “Top 10 Technology Hard Trends Shaping the Profession” and other key points. Rebekah Brown’s “Aware, Predict, Adapt” message also came through loud and clear. The bottom line is that CPA firms need to increase their future readiness in order to successfully navigate the fast future of change. In that spirit, Tom Hood’s statement that “robotics is predicted to automate or eliminate 40% of basic accounting work by 2020” made many attendees perk up their ears. The waves of changes are building as we speak — and these monumental shifts were soaked throughout the MACPA data and technology trends period. Accounting firms of various sizes, including one large multinational firm, have reported data breaches, some of which exposed personally identifiable information of employees and clients. Scattered throughout the days were discussions related to the skillsets required for the CPAs of the future; Bill Hinman of the SEC asking what firms are doing about protecting client data, and; Jon Lukomnik of the Investor Responsibility Research Center Institute touching on technological literacy. The question “Can we change fast enough to deal with the realities of the marketplace?” was a central thought weaved in and out of the various topics of the two-day gathering. Video and a summary of the discussions can be viewed here.